This dress is exquisite. We think this would make a great wedding dress, but it would be wonderful for a dance, festival, fair, or any other special occasion. This dress is in exceptional condition, with the tags still on. She has been in storage for about 40 years, waiting for you. 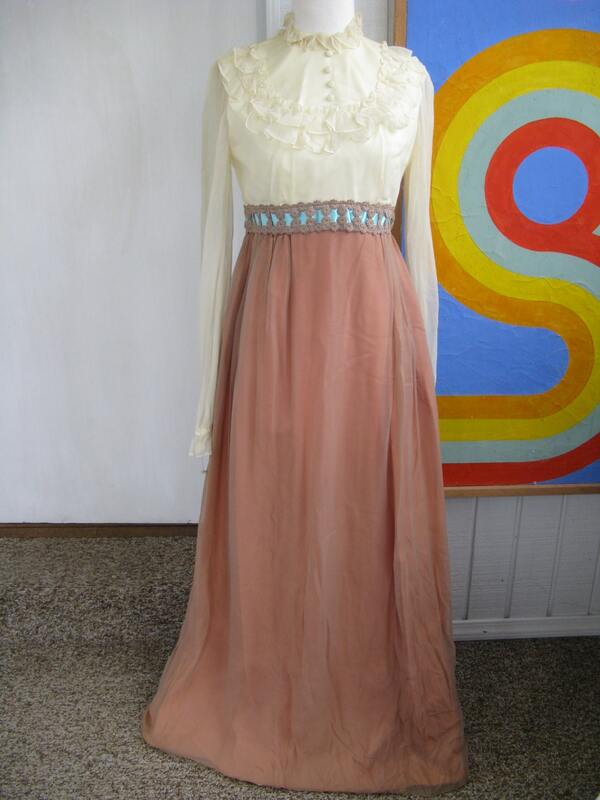 Cream, brown, and blue dress with a gauzy top layer, ribbon accents, and a high neck. Ribbon at the back. We don’t see any issues with this one, she looks perfect – she just needs pressing! Marked on tag size 11/12. Unstretched, fabric does not stretch. We purchased these beautiful 1960s and 1970s gowns from an estate in the Pittsburgh area, where they had been in storage for many years. We are really excited about getting them back onto the market! Any condition issues are noted in each individual listing. Unless noted, these dresses have not been cleaned, and we would recommend you take them to your cleaner to be freshened and pressed to ensure maximum satisfaction with your new purchase! We try hard to describe everything in our shop well and take accurate photographs. Condition and size are noted for each item when appropriate. Feel free to ask us lots of questions before you buy. Let us know if you’d like us to reserve something for you. Serious international buyers, convo us for shipping information! Thanks, and all the best from the Steel City! Great seller. Beautiful jacket. As described. Arrived quickly. We accept PayPal, debit and credit cards, and Etsy gift cards. Please pay within 3 days of your order. Please contact us if you’d like us to reserve something for you. We will reserve items for a maximum of two weeks. We try hard to describe everything in our shop well and take accurate photographs. Condition and size are noted for each item when appropriate. Feel free to ask us lots of questions before you buy. We do not offer refunds if an item does not fit, so please ask for any measurements you may be unsure of before you buy. If an item is damaged in shipping, we will refund 100% of the purchase price, minus shipping. If you buy something from us that you feel was misrepresented (for example, our measurements are incorrect), or if you notice a major flaw that we just didn’t see, you may return the item to us and we will refund 100% of the original purchase price, minus shipping. Please contact us within three days of receiving a damaged or misrepresented item, and include a photograph of the problem with the item. We're sorry, but we do not accept returns on international orders. However, if an item is damaged in shipping, we will refund 100% of the purchase price, minus shipping. We ship as often as possible, with large items going out on Tuesdays and Fridays. In general, we ship First Class or Priority mail, except for especially large or heavy items. Our shipping prices are estimated for maximum distance. If the difference between what we charge for shipping and the actual shipping cost is more than $2, we will refund the difference. Insurance is available upon request. We make every attempt to package items safely and securely. International buyers, we'd love to ship to you! Just ask us for a shipping estimate to your country. All items are kept in storage in a smoke and pet free environment. However, we can't speak for the habits of the previous owners. Most clothing items and housewares have been washed or cleaned. However, Dry Clean Only Items and some collectables are presented as we found them. Some items may need to be pressed. Specific information for each item is found in each listing. As always, feel free to ask us questions. Thanks, and all the best from the Steel City!